MotorDog69 designed and manufactured this USA made "Soldiers Cross" challenge coin to commemorate our soldiers Past and Present. My Father is a Korean War Army Veteran and we have been asked many times on the road for something like this to be made. We have to remember freedon is not free and our Veterans made the USA #1. 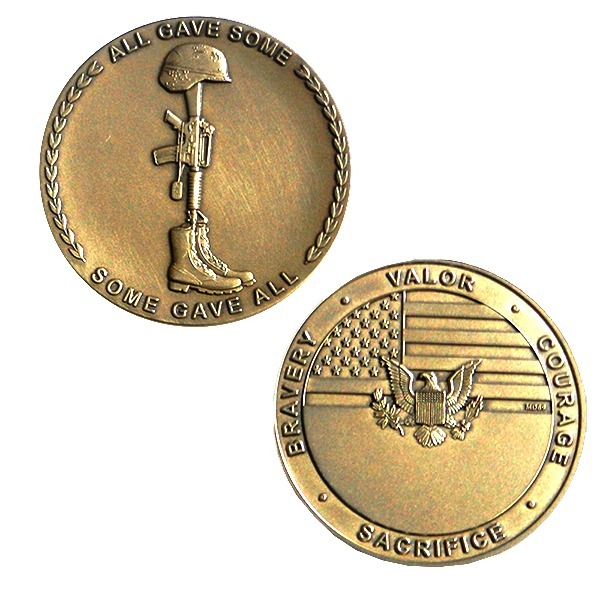 This Coin symbolizes and honors the Valor, Courage, Bravery, and Sacrifice of our fallen service men and women, the Veteran service men and women who have made it back from war, the soldiers who served with no war, and also those who have passed on here in the states, allowing us to keep our United States the Land Of The Free. This coin is made of 100% USA brass, with a antique bronze finish. The obverse of the coin has the Soldiers Cross with a wreath on the outer rim, including the words "All Gave Some" and "Some Gave All". The reverse has a large engravable area with the American Bald Eagle holding the arrows and grape leaves (symbolizing war and peace), with the American flag in the background. It is accented with the words of "Valor", "Courage", "Bravery", and "Sacrafice". This coin has a very stong meaning, and commemorates US Veterans Worldwide. Thank you for your service, past and present! This coin fits in a 1.8" Medallion Plate Cover.